You can check the balance on your River Island gift card online by clicking here. River Island is an established UK fashion chain with over 300 stores in the UK and Ireland and across Europe (Netherlands, Sweden) and the World (Peru, South Africa). Clothing is designed by their own team in West London. River Island has a great range of Menswear and Womenswear and has more recently introduced a range for kids. Ever popular, the company continues to win new fans. Where can I check my River Island giftcard balance? If you have a River Island gift card you can check the remaining balance on it using their online balance checker by clicking here. You can also check the balance on the card by handing the card to a member of staff at any of their stores. Click here for your nearest River Island store. Where can I buy a River Island Gift Card? 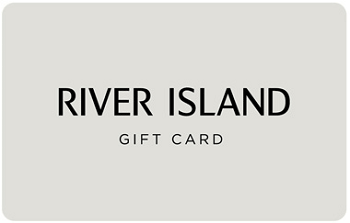 River Island gift cards are on sale at all branches of River Island in the UK and ROI. Click here to find your nearest River Island store. River Island also offer gift cards by post via their online shop – check here for delivery and payment details. We haven’t found River Island gift cards on sale in any major supermarkets (believe me, we research this stuff too!) So your best bet to get a gift card for a loved one is to find a River Island store or order one online, as above. Where can I spend the River Island gift card? The card is accepted at any UK River Island store. If you have a £ sterling card it can also be used in stores in the Republic of Ireland subject to the current exchange rate into Euros. You can also use the River Island gift card on the River Island website. The River Island giftcard will expire after 24 months if no transactions are made on it. Transactions do include balance enquiries so, if you are concerned about the card expiring, make a free balance check to extend the validity period.